Travel to Namibia and discover the most impressive landscapes in Africa. Experience unforgettable safaris in the Etosha National Park. Surprise yourself with the atmosphere of charming Swakopmund and see the famous red dunes of Sossusvlei in the Namib desert. Enjoy the otherworldly landscape of Sesriem and the ancient rock carvings of Twyfelfontein, before exploring the capital of Windhoek. International flights: UK - Windhoek - UK. 9 Breakfasts & 9 Dinners. * Possibility of booking optional excursions in the next step of the booking. Please note that all additional optional excursions which are not selected at the time of booking must be requested before final payment is made at least 60 days before departure. The final price will be shown once you have selected the optional excursions, in the final step of the reservation process. Arrive at your UK departure airport ready to board a flight to Hosea Kutako International Airport in Windhoek. Night on board. 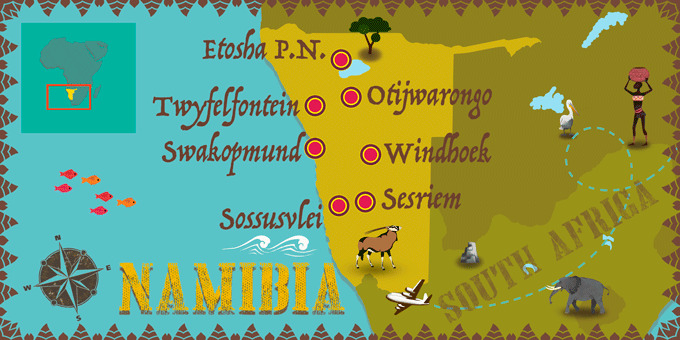 Arrive in Windhoek, meet your guide and depart to Otjiwarongo. Arrive in Otjiwarongo, set in beautiful countryside and depending on your arrival time, enjoy a visit at the local craft market in Okahandja. The rest of the day is at your leisure. Dinner and overnight stay in Otjwarongo. Breakfast at the hotel. Depart for a safari in the Etosha National Park. This Park is one of the main attractions of Namibia. Etosha National Park offers one of the most beautiful scenes of wildlife in the world. It is home to 114 mammal species and 340 varieties of bird. Dinner and overnight stay in Etosha National Park. Breakfast at the lodge. Enjoy a full-day game drive in the Etosha National Park today. Cover a vast distance for the best opportunities to watch the varied wildlife and admire the changing landscapes across the savannah. In the evening return to the lodge for dinner and an overnight stay in Etosha National Park. Breakfast at the hotel. In the morning, enjoy a visit to a traditional Himba Village and learn about the life of the indigenous population that live here. Next, set off for Twyfelfontein, and along the way stop to visit the paleontological site of the 'petrified forest' where fossilized trunks are half buried in the sandstone and covered with sediment. Explore Twyfelfontein Rock, home to the largest collection of petroglyph rock engravings in Africa. Dinner and overnight stay in Twyfelfontein. Breakfast at the hotel. In the morning, visit the small mining village of Uis, for great views of the Brandberg Mountain, the highest in Namibia. Afterwards, leave for Swakopmund, an absolutely charming coastal city, with colourful buildings that face the sandy beaches that line the Atlantic Coast. Arrive in Swakopmund, check in to the hotel and spend the afternoon exploring at your leisure. Dinner and overnight stay in Swakopmund. Breakfast at the hotel. The day is at your leisure to relax in Swakopmund. We recommend a number of optional excursions, from a boat cruise on Walvis Bay to Quad Biking in the sand dunes. * Dinner in a seafront restaurant and overnight stay in Swakopmund. * Optional Boatcruise on Walvis Bay: Enjoy a morning boat cruise on Walvis Bay to look for seals and dolphins and soak up the beautiful landscape. Light lunch with oysters included. Price per person: 41£. Breakfast at the hotel. Continue your journey towards Sesriem and be amazed by the passing landscape and the Kuiseb Pass, a beautiful river which stops the progression of the sand dunes in the north. Arrive in Sesriem in the afternoon and spend the rest of the day at your leisure, enjoying the surrounding mountain ranges and vast landscapes. Dinner and overnight stay in Sesriem. Early breakfast at the lodge. Depart before sunrise to enjoy the colours of the Namib desert, one of the oldest deserts on the planet with the highest sand dunes in the world. Visit Sossusvlei and Deadvlei and explore the salt and clay pans on foot to get up close to this spectacular landmark and admire the contrasts between the red sand dunes and pale salt pan. In the afternoon, head to the Sesriem Canyon, located on the Tsauchab River, with a depth of 30 metres. Return to the hotel for an afternoon at your leisure and dinner and overnight stay in Sesriem. Breakfast at the hotel. Enjoy a free morning before transferring back to the lively city of Windhoek and spend the rest of the day relaxing or enjoying some shopping time. In the evening enjoy dinner at Joe's Beerhouse. Overnight stay in Windhoek. Breakfast at the hotel. Spend the morning at your leisure and then check-out. Transfer to the airport for a return flight back to the UK. Night on board.